Suppliers ofIndustrial Minerals - Slate Powders and Granules. Inert fillers, extenders & coatings from The Delabole Slate Company, Cornwall. 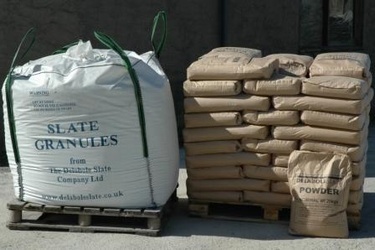 HOW TO BUY... Delabole Slate Powders & Granules are available in 25kg paper sacks or approx. 1 tonne bulk bags. You can buy just one bag or 1000 tonnes. The quantity required by weight. The packaging option you would like. We can help...If you are unsure of the grade or product you need, just tell us what you make and we can tell you the product normally used for your type of process.